This project will provide 30 people on the Thai/Burma border with a 10 month training course covering subjects such as social change, human rights, environment and law. The school program is varied including classroom teaching, group work, field trips, discussions, presentations, reporting and assessments. After finishing the training course, graduates will be expected to become mobile trainers and spread their new knowledge and skills into borderline areas and inside Karenni state in Burma. Over twenty years, more than 22,000 Karenni people have become relocated as refugees in Thailand, with many more living as Internally Displaced Persons (IDPs) or living in hiding inside Karenni State, Burma. For many thousands of young Karenni people in the refugee camps, there are very limited opportunities for education and training so most of the Karenni people do not know about human rights and how to protect their rights. 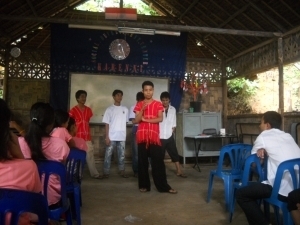 Without knowledge of the rule of law and appropriate dispute resolution, Karenni society and the refugee community can not develop social institutions and protect individual dignity. This project will address this need, creating mobile trainers who can spread knowledge on human rights, rule of law, democracy and environmental protection in the border area and also inside Burma. The students will spend nine months in classroom instruction and one month working in the field to gather and present testimony related to our coursework. There will also be six hours of in-class and two to three hours of homework per day as well as the chance to learn computer skills once a week. At SDC, 8 training programs have successfully been completed and 149 students have graduated from SDC. Graduates are committed to serving as human rights and environment activists. Many of the graduates from Social Development Center have gone to work in local community based organization such as the Karenni Justice Department, Youth and Women’s Organizations, Karenni Ever Green, Security Department and other Karenni NGOs. 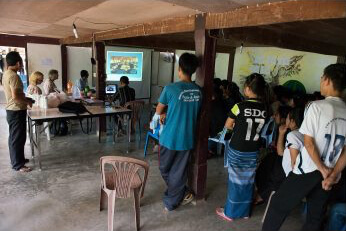 Still others have traveled at great risk into Burma to pass on their new knowledge and skills to communities inside and/or to interview villagers in order to collect information on the human rights and environment situation inside Karenni State. The Karenni Social Development Center received 86 applications for their basic course this year, and of them 30 students were accepted. 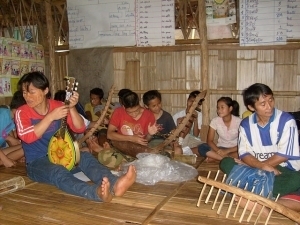 The students received lessons in all the subjects planned. In addition they were taughtfact-finding, report writing and interview skills. All students had to write up a report on their field work. In addition to the basic course, the Centre ran an Advanced Community Management Course. After a competitive process, 15 out of 40 applicants were selected to undertake this course which gave lessons in office management, project management and planning, campaign and advocacy, peace building, fundraising, report writing and research. All students graduated on September 29th. 2012.